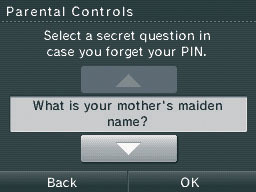 The Parental Controls setting allows you to manage what Nintendo DSi-exclusive and Nintendo DSi-compatible content is accessible to the console users. During the initial setup, you will be asked whether you wish to set up Parental Controls. On the System Settings Menu, go to the 3rd page, then select "Parental Controls." Select "YES," "NEXT," then "OK" to reach the PIN screen. 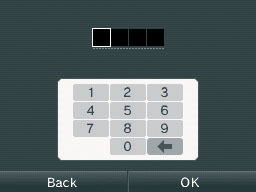 Select "NEXT," enter a four-digit PIN, then tap "OK." Enter the PIN again to confirm it, then tap "OK" again. Tap the up/down arrows to scroll through the secret questions. When the desired question is displayed, select "OK" to continue. Select "OK" again, use the on-screen keyboard to enter an answer to the secret question, then select "OK." The answer must be six or more characters long. Select "OK," then tap the left/right arrows to scroll to the game rating icon for the highest-rated video game content that's suitable for viewing on the system. Select "OK" to continue. The system will take you through a number of questions, where you'll choose which features to restrict. Select "YES" to block the feature or "NO" to allow it. Select "OK" to confirm your selection. 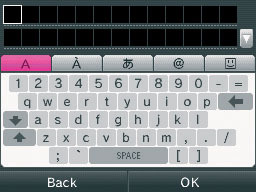 You can block access to the PictoChat application. Parents who wish to monitor what messages their children can receive from other Nintendo DSi systems through DS Wireless Communications may find this useful. You can block access to DS Download Play. This will prevent game data from being sent to the system. With DS Download Play, you can download and play certain multiplayer games with other Nintendo DS system users even if you have only one copy of a game. You can also send and receive demos of certain software titles. If you have downloaded the Nintendo DSi Browser, you can block access to this and prevent any browsing of Internet websites. You can restrict the use of Nintendo DSi points in the Nintendo DSi Shop. This does not block the purchase of points with a Credit Card, nor does it block the redemption of points by entering a Nintendo Points card. You can block the ability to exchange photos with other Nintendo DSi systems over DS Wireless Communications. This will block certain user-created content. For example, games or applications might allow the exchange of user-created levels, artwork, etc. * Please note: Unfortunately the Nintendo Wi-Fi Connection Service, which allows for these particular feautres, is currently not available in South Africa. Select "YES" to save the Parental Control settings and return to the System Settings menu.